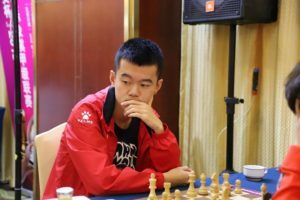 Ding Liren is about to set a personal record as he gets closer to a 2800 Elo rating following his performance in the Chinese Chess League. Rounds five through seven of the Chinese League were held in Shenzhen this week. The team from Shanghai currently leads the league, but the performance of Ding Liren (who plays for Zheijang) has attracted attention. He has had a strong showing, winning all five of his games so far, and by beating Ivan Cheparinov in the seventh round he nudged up past Vladimir Kramnik to the fourth spot in the world rankings and is less than three Elo points shy of 2800.